Between 1956 and 1977 characters used in mainland China went through various rounds of reform. While Hong Kong, Macao and Taiwan sticked to the traditional form of characters, mainland China and Singapore are using the simplified forms now. Simplified simply means less strokes per character and therefore a higher speed in writing. The character for brain for example looks like this 腦 in its traditional form and like this 脑 in its simplified one. The characters used on Wohok.com for Mandarin are all simplified ones. Radicals are components of characters. There are officially 214 radicals, but sometimes up to 227 are used. Radicals are particularly important when using a Chinese dictionary. Every character belongs to one radical and as a result some Chinese dictionaries use radicals and stroke count to order entries instead of the alphabetic order usually used in dictionaries for foreigners. Nevertheless, it is not necessary to study radicals, over time the important ones will be remembered automatically. More information can be found on Wikipedia. Strokes are the dots or lines characters are built up by. There are various different ways and systems to classify them, resulting in a different number of strokes each. This picture shows quite well what strokes are. Again, there is no real need to learn anything about strokes themselves. The stroke count is also nothing that needs to be studied but is understood automatically when using a dictionary a couple of times. Stroke order, however, is something that needs to be addressed. Stroke order means which stroke to write first, which second, etc. As there are different ways for different forms of characters, the one explained here is the one used in Mainland China for simplified characters. There are three main reasons why this should be learned properly right in the beginning: Reason 1 is that Chinese people can see if characters are written properly, reason 2 being that - even though some people including myself think differently in the beginning - following the rules is the quickest way to write characters, and reason 3 being that for advanced students a proper stroke order is often mandatory and changing at that stage is very very difficult. Having said that, although the rules should be followed, perfection shouldn't be in the way of quick progress, so one or two strokes in the wrong order are by no means a problem, even Chinese don't abide by the rules all the time, but overall follwoing the rules can be seen as fairly important. This is the most basic and probably also most important rule. Except for some exceptions (see below) this is always true. It is also true for more complicated characters. 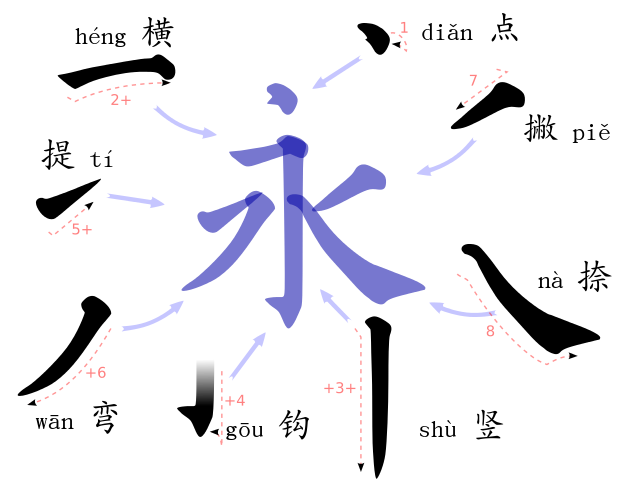 Writing the character 想 for example, 木 is written first followed by 目 and finally 心. In case they cross each other, horizontal strokes are written before vertical ones. Strokes passing through the whole character, regardless of vertically (沸) or horizontally (母), are written last. As can be seen in the animation, right-to-left diagonals are written before left-to-right ones. In vertically symmetrical characters, the central stroke is written first. Normally outside is written before inside, this is also true for characters like 同 or 月. This should actually be clear, but the left stroke of the outside part or an enclosure is written first. For characters like 道, 建 or 凶 the enclosure part is written last (as can be seen in the animation on the left). And finally, dots and minor strokes are written last. First there is no space between words. This is not as difficult for writing as it is for reading (see below) but should be pointed out for absolute beginners. And secondly the full stop is different. In Chinese "。" is used to mark a sentence as finished, comma, question mark, etc. are more or less the same as in English. There is a great article on Wikipedia providing further details on this topic. Reading characters is probably as difficult as writing them. And there's probably just one way of really learning this, which is practice, practice, practice. The first obvious problem is the lack of spaces between words. This is particularly difficult for beginners and gets easier the longer people learn Chinese. Words in Chinese usually consist of 1 to 4 characters, so knowing most of the words in a sentence is key, especially in the beginning. Another problem, especially for loud reading, is that some characters like 行 or 得 have more than one way of pronounciation. For people reading stuff for themselves, this doesn't really matter, meaning is key here, but for people doing courses this might be important. As said before, practice is most important for improving reading. In the beginning learning vocabularies is also very important, Flashcards might be helpful for that. On the long term, however, reading a lot is not just beneficial for reading itself, but also improves the feeling for language, grammar, vocabulary and potentially even listening. For writing, some final tips are to really follow the rules right from the beginning and to practice regularly. Similar to reading, Flashcards might also be helpful in doing so as they require daily use. The English to Chinese one is best suited when it comes to practicing writing. Reading, again, is all about practicing. It is important, especially in the beginning, to read articles with not too many unknown words. There are books with limited amount of vocabularies, or simply going for suitable HSK practicing material is also possible.